On Monday, March 12, Gibson GuitarTown II launched on The Sunset Strip in West Hollywood with the unveiling of the first nine 10-foot tall guitar sculptures. The selection includes works from renowned artists Shepard Fairey, Tristan Eaton, Free Humanity, Smog City and DeeKay, and celebrates top musicians, including Van Halen, Rage Against The Machine and Jane’s Addiction, among others. 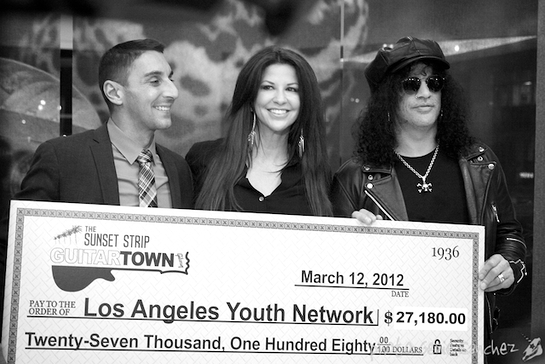 The launch event featured a check presentation by legendary guitarist Slash – who is in the studio finishing his second solo album Apocalyptic Love due out May 22 – and his wife Perla Hudson to 2010-11 GuitarTown charity recipient, Los Angeles Youth Network (LAYN). LAYN will receive $27,180 from the auction of the previous round of GuitarTown art guitars, which included guitars celebrating Slash, Ozzy Osbourne, Mötley Crüe, The Runaways, Oingo Boingo and Cheech & Chong, among others. Slash and Perla have worked closely with LAYN – which provides outreach, food, emergency shelter, transitional living and educational enrichment programs for homeless adolescents – for several years. 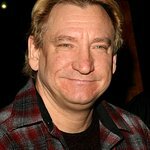 Other organizations to benefit from the auction proceeds include West Hollywood Arts & Cultural Affairs Commission to further support public art and artists on The Sunset Strip and the West Hollywood Library. GIBSON GUITARTOWN ON THE SUNSET STRIP launched in August 2010 featuring more than 20 10-foot tall fiberglass Gibson Les Paul model guitars strategically placed on the legendary Sunset Strip. Each guitar sculpture celebrated a musician, personality or artist unique to The Sunset Strip’s history. As intended, the 24 guitars were auctioned off this past December 2011 after their yearlong “tour” with 100% of the $54,360 in profits going to charity. The public art project is now moving into its second phase with the first nine new guitars – out of more than 20 total – being exclusively unveiled at an invitation-only event hosted by Hornburg Los Angeles on The Sunset Strip at their luxurious Jaguar and Land Rover showroom. The Sunset Strip Business Association, which is presenting the project in conjunction with Gibson, plans to unveil additional art guitars later this spring. All art guitars will be created by local and nationally recognized artists and will celebrate people and places that have shaped The Strip. As with the first exhibit, these guitars will eventually be auctioned with proceeds benefiting charity. For a map and photos of the guitars, click here. The Gibson Foundation is the philanthropic division of Gibson Guitar Corp., with a mission to make the world a better world for children through its initiatives such as GuitarTown, Music Rising and Soundwaves, as well as through its support of music & the arts, education, health & welfare and environmental causes.